Bathys Hawaii is small firm - we seldom offer our full line of models at any given time. Usually we have between 1 - 3 models in stock. We produce our timepieces in extremely limited production runs and in some cases we sell out in just a few days (or hours). Below is listed all the models we have made to date with their specifications, this will give you a sense of what we make and what might be coming up next. Our online store lists only models we have currently in stock. This is the timepiece that got it all started in 2005, and remains to this day our most popular model. Here in Hawaii we fish "the 100 Fathom Line" because at this depth many fish species can be found. On the Big Island you'll see boat after boat tracing out this invisible line along the ocean floor, trolling for ono, marlin and ahi tuna. This timepiece features a 41mm 316L stainless steel case, domed anti-reflection sapphire crystal, and a Swiss large date movement. The screw-down crown offers water resistant to 200 meters, and comes on one of our famous waterproof leather straps. We triple-print our Superluminova® indices so they glow all night long so you'll never lose track of time even under the darkest conditions. New for 2016, the Benthic COSC Diver is perhaps our crowning achievement thus far. Very few companies have produced a COSC-certified Diver watch with an exhibition caseback that can withstand the pressure of 200 meters of ocean - this one can. Each watch is run through a series of timing tests based criteria of the ISO 3159 - which means that over the course of 15 days, in temperatures ranging from 8ºC to 38ºC, and in five positions, the watch maintains a rate of -4/+6 seconds with a mean variation of 2 seconds. For professionals who require the utmost in accuracy from a mechanical watch, this is for you. If you're going to release a watch called a "Professional Diver", it had better be ready to spend a lot of time at depth. 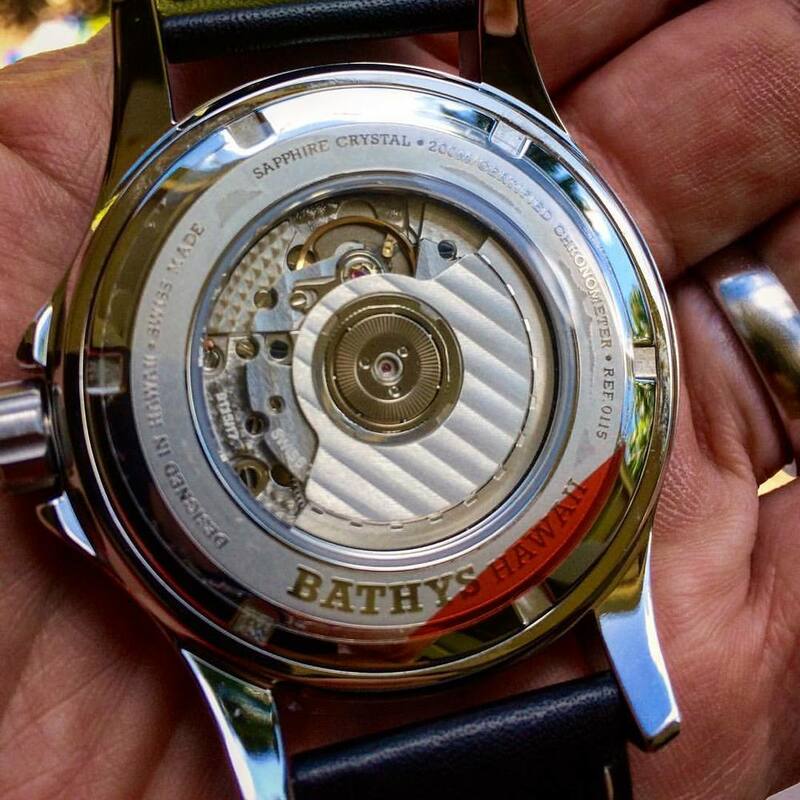 Bathys Hawaii watches are ready for the pressure. Featuring an Swiss automatic ETA 2892-2A movement, our watches are rated to 200 M, and have screw down crowns, a unidirectional diving bezel, solid 316L stainless steel cases, and can be had on either waterproof leather or rubber straps. Our latest model features an all-sapphire exhibition caseback and is identical to the COSC chronometer we make - however it is not sent to COSC for certification. It's a way to get a lot of watch without spending a lot of money. We are based in Hawaii, so essentially the rest of the world is located in another timezone. To make life easier for ourselves - and anyone else who travels the globe or has business to conduct in another part of the world, we created our first GMT model. The new Benthic GMT features a large GMT pointer and a 24 hour time readout along the rehaut ring, making knowing the time in Tokyo, Sydney or LA a breeze. We've made sure the indicators are clearly legible and identifiable even in complete darkness. So you'll always know where you stand. The Benthic Ti is bold. It doesn't shirk away from anything. 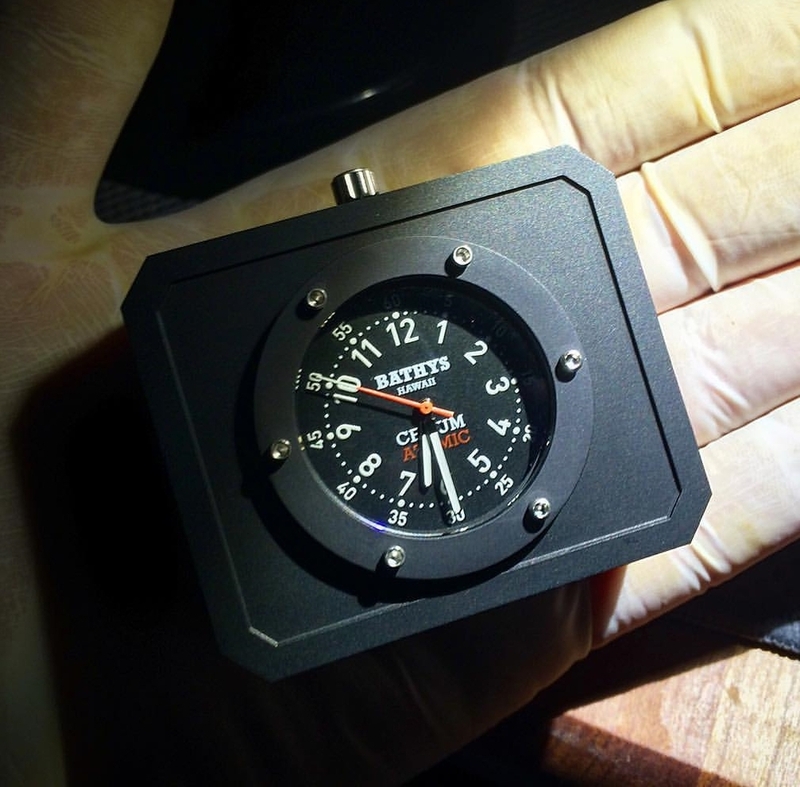 The solid 48mm case was carefully designed to "wear small" while being large. The lugs reach around the wrist and there's essentially zero caseback depth; the watch is a fairly-slim 15mm in height. So it's no hockey puck on your arm, in fact its lightweight, solid Grade 5 titanium case makes it feel like an extension of your body. Inside lives a 15 ligne Swiss-made RONDA Mastertech quartz movement, with solid brass bridges, jeweled gear train, both large date and retrograde day complications. If this watch were an automatic, it could easily cost 10x more, but we know not everybody has money like that to spend on a timepiece..so this is our response. At the root of all Bathys Hawaii watches is a simple, clean design philosophy. Our 100 Fathom Automatic holds true to this way of thinking. Nothing extra - just the time and date. Imminently readable, this timepiece is just plain elegant. Inside we use either a Sellita SW200 or ETA 2824 Swiss Made automatic movement - both of which deliver not years, but decades of reliable service. And since we make our watches in such limited production, the odds you'll ever see another on someone else are very low. Bathys Hawaii was founded at a pearl farm on Hawaii's Big Island. The founder, John Patterson, was conducting research on the biochemistry of "nacre" - but what most people call mother of pearl. It's a remarkable biocomposite material, in fact mother of pearl is chemically the same as chalk (calcium carbonate), but has a tiny amount of specialized proteins that make it 4000x harder. So yeah, it's fancy looking, but for us, it's our heritage - it's why Bathys Hawaii exists at all. At 36mm, the Lunar Midsize was created for people who prefer a smaller wristwatch. Drawing on design cues from military watches of the 1940s and 1950s, in many respects the Lunar harkens back to the "golden age" of Swiss watchmaking. Featuring a Swiss-Made quartz movement with a moonphase complication, one can follow the phases of the moon and stay in harmony with the natural cycles of the planet. And while some will tell you to fish for ahi on a moonless night, and others will swear the tuna only bite under a full moon, you will always know know what the moon is doing. Before GPS, before radar, brave men flew bombing missions using only a compass and a dash-mounted clock. Under cover of darkness, over the vast featureless ocean, or when the target was obscured by clouds, WW2 navigators had to have the most accurate timing possible to rendezvous at the IP - the initial point - of the bombing run. After the war, some lucky aviators removed the navigation clocks from their bombers and wore them on a leather strap as a wristwatch. The Bathys Hawaii Bombtimer pays homage to those men, by replicating the look and precision of the navigation clocks. Thus far we have only produced two of these models, however we hope to make more in the future. A core value of Bathys Hawaii is mixing modern and traditional. In 2009 we teamed up with Friedrich Schneider - arguably the pioneer in creating rust-free Damascus steel - to create several truly unique timepieces. These cases were made by Herr Schneider himself, by hand, spending hours at a hot forge, folding and refolding the molten stainless steel ingot. The metal was then CNC-machined into a unique case design to Bathys Hawaii specifications. Unfortunately 2009 was known for the start of the largest global collapse in in history, and this project was placed on hold. We hope to revisit this concept and create more of these amazing, one-of-a-kind watches in the future. The Cesium 133 Atomic Watch was the first atomic-clock based wristwatch in the world. It first ran successfully September 28, 2013 and garnered worldwide attention. Inside, a chip-scale atomic clock generates over 9,000,000,000 pulses per second, allowing for unequaled precision in a watch you can wear on your arm. People say it's large, and kinda it is. But for a device with the capability to match the accuracy of a GPS satellite, or time-stamp an autonomous computer network located inside a cave, it's DAMN SMALL. Sold Exclusively via Kickstarter, 10 pieces sold out in 60 hours.